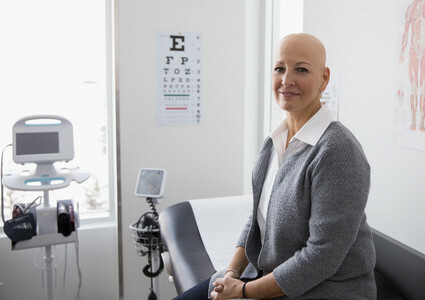 When you are told you have to undergo chemotherapy, the words, “You are going to lose your hair,” can be very distressful for women and men alike. The fear of the unknown can make the thought of hair loss unbearable. Hair can be a big part of a person’s identity. 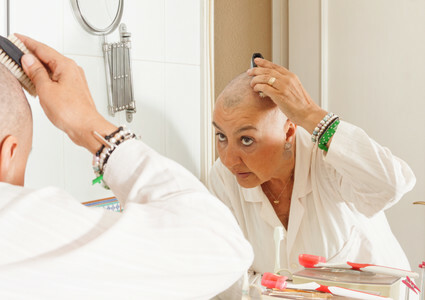 Once treatment starts and hair loss begins, the reality of your cancer diagnosis is always staring back at you in the mirror. Not seeing the person you used to be, can be disheartening and difficult. Dealing with hair loss, both emotionally and physically, can be easier once you know what to expect. Why does hair loss occur with chemotherapy? Chemotherapy-induced alopecia (hair loss) comes from the cellular level. Chemotherapy is effective in targeting all fast-growing dividing cells. The hair follicle is a highly active structure with a host of cells that frequently divide to produce the growth of hair; therefore, it is also affected by treatment. Hair loss often begins between the 14th and 21st day after your first treatment. You may experience it a bit earlier depending on the type of treatment or if you’ve had surgery before starting treatment. What happens when I lose my hair? It begins with the loss of just a few strands. You may notice some tenderness in areas of your scalp. This is an indication that hair loss will occur in that area soon. You may wake up one day and not notice any hair loss at all, then by the middle of the day you start shedding hair. The shedding will start lightly and increase in volume. This is normally when we hear from patients asking to have their heads shaved at our Inner Beauty Salon. For those who lose hair, the decision to shave their head is always black and white: YES, I am ready, or NO, I am not. When that time comes, you can make the decision on where or how you want to go about shaving your head. Some ladies are pro-active and decide to cut their hair short before hair loss. Some also shave their heads prior to experiencing hair loss because they want the choice and control of when they lose their hair. Most already have wigs picked out. Just a note: NEVER use a straight edge razor to shave your head. This can cause infection. We suggest using clippers, resulting in a “G.I. Jane” look. The stubble left behind will fall out as time goes on. It is best to sleep in a soft chemo beanie to capture those hairs so they do not get all over your pillow. What are other possible side effects of hair loss? First, some words of encouragement, because it all sounds so scary. If you have discomfort, it will pass! You may have none of the symptoms listed above, or you may have a few. If you experience any unpleasant side effects, they will last about two to three weeks or less. There are ways you can minimize these negative side effects. Click here for tips on taking care of your scalp and minimizing your discomfort. Will I lose all my hair or will it just thin? Your hair loss is determined by what chemotherapy drugs you are taking. Some cause partial hair loss while others cause complete hair loss. Will I lose eyelashes and eyebrows? This will depend on your chemotherapy drugs, as well as the amount of treatments you have. It is possible if you are undergoing 12 chemo treatments or more to lose all of your eyebrows and eyelashes. Eyebrow and eyelash loss usually doesn’t occur until later in your treatment. When will my hair start growing again? Every person is different in how fast his or her hair starts to grow back. Some see growth towards the end of treatment, while it takes others three to six months to really start seeing good results. Once the hair starts growing, you may notice a change in texture or color. It may come in curly! What if my hair comes back in thin? While this is not the norm, it is always a possibility. The first step is to get into a healthy hair regimen. Our licensed clinical cosmetologists at Inner Beauty can educate you on how to best go about this. We also have many hair-piece options for thin hair, assessed on an individual basis. Our Inner Beauty teams are licensed clinical cosmetologists and certified orthotic mastectomy professionals. Our passion is to offer hope to those who are undergoing treatment by educating and walking through the journey with them. We offer services that provide encouragement for your inner self while giving you the outward confidence in your appearance so you can look in the mirror and see the beautiful YOU looking back. 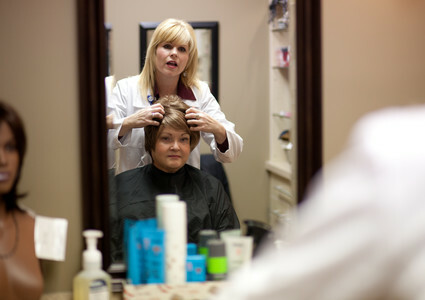 To schedule a personal appointment at Inner Beauty: A Specialty Salon for Cancer Survivors, call (402) 354-7813. As a beauty specialist for more than 38 years, Lori Fuchs has worked as a regional and national educator, makeup artist and skin care specialist. She is a clinical cosmetologist, a certified mastectomy fitter, and the coordinator of Inner Beauty: A Specialty Salon for Cancer Survivors.